The process of using an address or intersection to get geographic coordinates for the purpose of mapping a location is known as geocoding. NYCityMap relies on the Department of City Planning’s mainframe-based Geosupport system (Geosupport was developed specifically for New York City in the 1980’s and has evolved over time to handle the many NYC addressing anomalies including Queens hypenated address – well before others could, out-of-sequence addressing and Edgewater Park.) for basic geocoding functionality. There are different methods that can be employed for geocoding an address. One approach, often called fall-back or cascade geocoding, attempts to find a match using the highest degree of precision and moves to lower precision methods until a match is found (if one exists). NYCityMap employs a fall-back approach using Geosupport for the individual geocoding requests (i.e., passes) and then queries the spatial data to render the results on a map. This results in different types of maps being rendered after submitting an address search. The first pass tries to match an input address against the actual address(es) associated with a tax parcel or building. 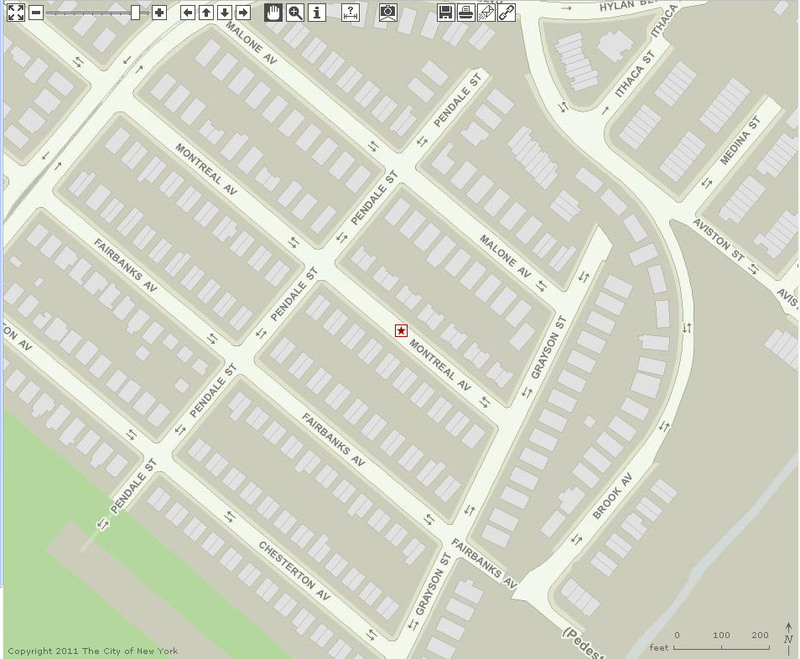 The unique identifiers for these features are returned as part of a successful geocode. These identifiers are then used to query the database to find a match and render the results on the map. 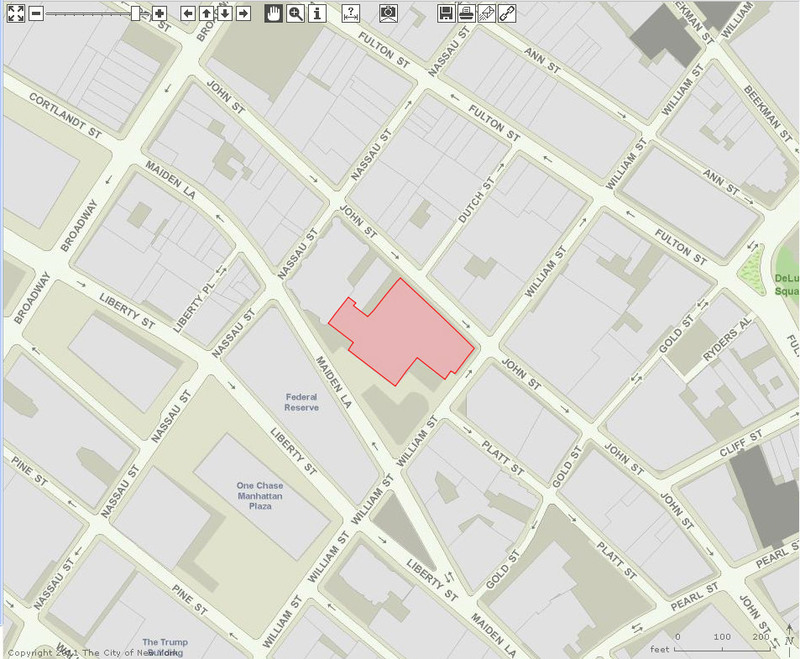 If a building match is found, the building is highlighted in the resulting map (see example below) and building-level information is available. If a building is not found but a tax parcel is (pass two), a star representing the center of the tax parcel is placed in the resulting map (see example below). This method results in a star placed at the interpolated location between the high and low addresses as shown in the example below. This method is included to ensure the highest hit rate. An address may be missing from a database or a person may not have indicated the correct house number. For this method, building and property level information is not available. We’ve added the locations of a few health facilities to NYCityMap. You can find them all in the Health Facilities group. Also in this release we have upgraded from MapPLUTO 10v1 to 10v2. MapPLUTO is available from the NYC Department of City Planning, you can find out more information from their Bytes of the Big Apple website. 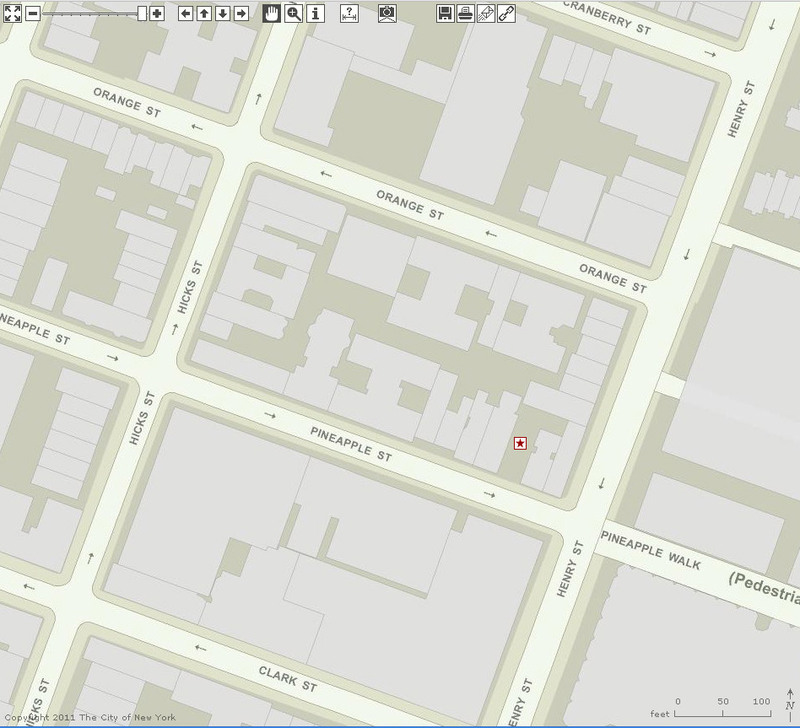 NYCityMap uses MapPLUTO to provide much of the building information that you see when you search for an address or identify a building on the basemap.